Being third a in queue never seems that bad, especially a queue of several thousand people. 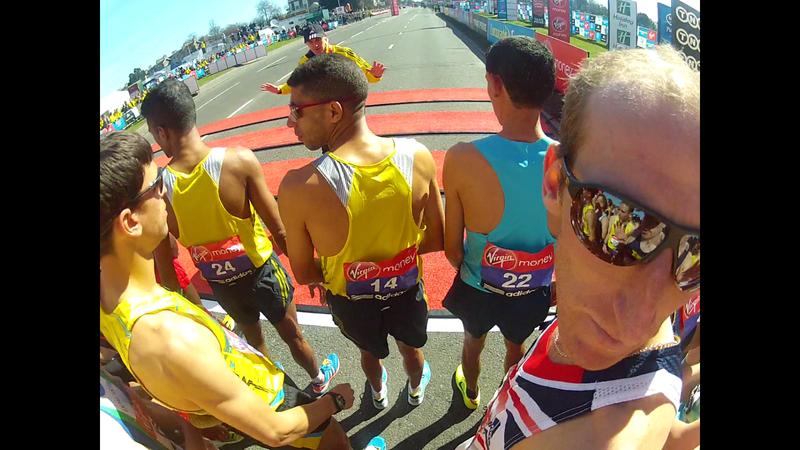 I'd almost made it to pole position on the start grid of the London marathon, but as the gun went off I set off at a jog; third row seems a long way back when you're stuck behind a Skoda. 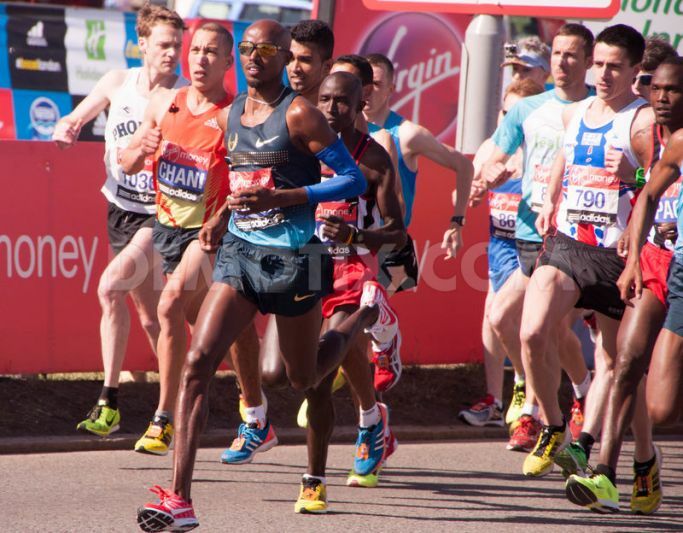 To be fair that Skoda was Simon overall, Britain's fastest marathon runner, someone far quicker than I could ever hope to be, but my challenge was to lead the London marathon after 400 meters and every second I wasn't going flat out meant Mo Farah was building a comfortable lead. I had originally thought that the challenge might be possible, as I was lucky enough to have a championship place, so could in theory start just behind the internationals The winners normally average a 71 seconds per 400 meters throughout the marathon, so allowing for a slightly quicker start I figured that if I could somehow skirt round the pack within five seconds of starting I might stand a chance. Twenty minutes before the start I took up my position, forty meters from the line, the closest I could get at this stage, while the other runners warmed up around me. I'd always hoped that I'd blend right in among the championship athletes, but my visor with a go pro strapped on duct tape scuppered that idea. As the area filled I received a few odd looks, but mainly smiles and laughs and the atmosphere was far more relaxed than I had expected. 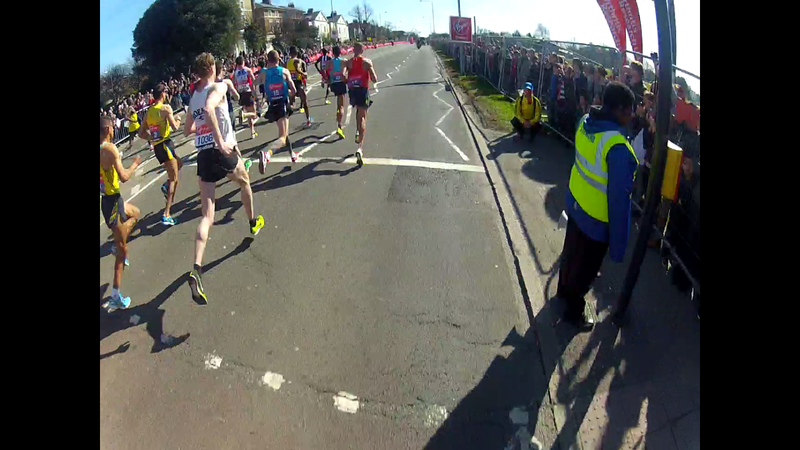 The area filled and the pro's started pacing in front of us until the marshals edged us towards the start line. 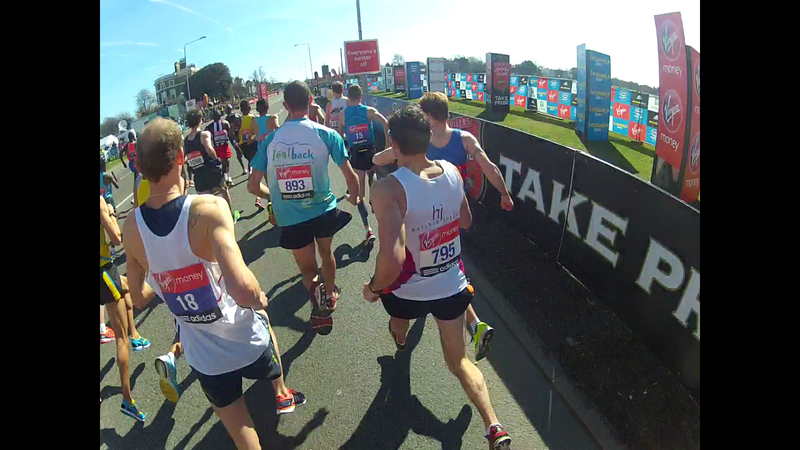 The length of the front row reduced as we neared and the marshals struggled to contain the surge as runners jostled for position in a very British way - polite passive aggression all round. My pace band of 3.10 was being noticed and I was being squeezed out by runners unwilling to start behind someone going so slowly. 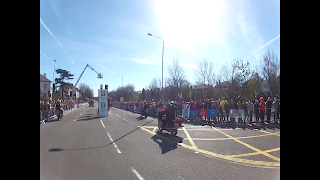 I'd lost my position, so explained my plan to my neighbours- one was confused, one unimpressed, but thankfully one suitably amused, who swapped places placing me directly behind the pro's. The greatest marathon field ever assembled were then individually introduced to the cameras and my plan to keep a low profile worked - no mention of me by Dave Beresford. It's far easier to win a race no one else knows they're in. Following the quietest silence I've ever heard we were off. 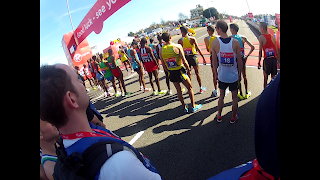 Almost immediately the two rows ahead of me closed rank and two became four, the Kenyans were already streaking away, but I was boxed in - a few more meters and they'd be gone. 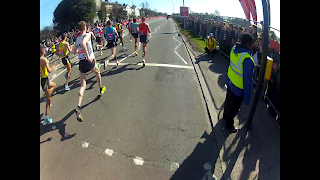 As the pro's bunched to the centre I found a small gap between two runners and then in a mild panic mounted the pavement and ran along the muddy verge. 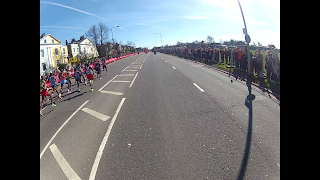 The other runners followed into the center and I was free, with clear road ahead of me, but still flanked by numerous elites ahead of me, blocking any sight of the leaders. I started to run hard and then out I popped, at the front of the right hand lane. I glanced over to see the lead pack and they were only ten meters ahead, I still wasn't full pelt, so I pushed a little harder and before I knew it I was passing them. I flashed a little smile expecting to see concern on their faces, but their reactions were a mix of bemusement and nonchalance, as if they'd just seen a cow try to mate with a horse. Could it be the fact that I was white gave me away as not a serious contender, hmm, that or the fact I had a go pro strapped to a flapping blue visor. 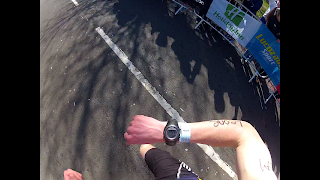 I started to push away and was quickly closing in on the camera bike, who was tracking the pack. I couldn't figure out if he hadn't seen me or if he had to stay put to keep his camera angle, but I needed proof and it was clear that the cameras were either unaware or ignoring me, so I jumped the verge to the left hand lane and lead out the pack. 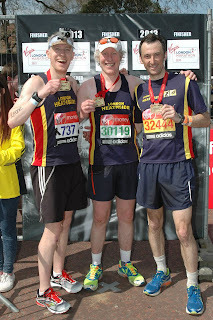 It felt great, people were cheering, the odd person laughing, yet after a while I wasn't really sure what to do. I felt I could probably carry on at this pace for another minute or so, but I'd passed 400 meters, the challenge was met and I still has a marathon left to run. 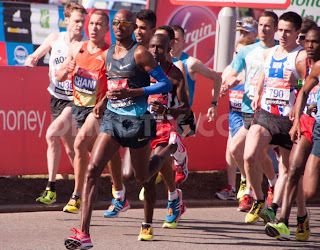 I couldn't just slow down, I'd obstruct the other runners, so I held my arms to reveal my Sierra Leone hash tags and then skipped back to the other side of the road. I slowed down and checked my watch and despite the slow start had averaged a speed of 4:20 per mile. I looked up and just like that, they were gone. The rest of the run was pure joy, club mates throughout the course, the sun shining for the first time this year. I was meant to be pacing 3:09 for the second part of the challenge, but ended up finishing in 3:03, probably a bit foolish given the challenges to come, but wearing a big cheesy grin for 26 miles is like rocket fuel. Challenge 2 and 3 accomplished, half way there. next up finishing inside the top ten of the worlds biggest assault course. If you enjoyed this post, please share on social media and subscribe to this blog in the top right of the page!!! Bloody brilliant - love it! Made it here from Lazy Girl Running - echoing Sally - Bloody brilliant! I'm so impressed, I've blogged about this, with a link to your Virgin Money Giving page in the hope it might help you raise some more for this very worthwhile charity. Best of uck with teh rest of the challenges! Thanks Black and Tabby, very much appreciated. What's the story behind the nickname?